Science fiction adventure? A strange bowl shaped structure in space? Bird-like aliens that “adopt” species they come across? An alien planet that sends out confusing information? Shut up and take my money! Right? Not so much, as it turns out. 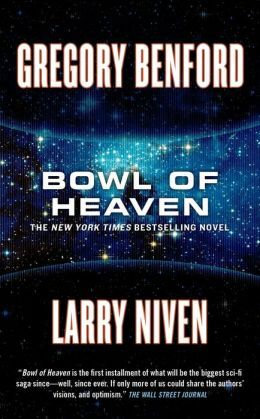 The Bowl of Heaven starts out as you’d expect a science fiction adventure story to start: we’ve found a planet that could be another Earth, a new home for a humanity that’s quickly outgrowing Earth. Nicknamed Glory, a large expedition is put together to sleep most of the way, and assess the situation when they reach Glory. And they wouldn’t have awoken biologist Cliff Kammesh if it wasn’t an emergency. The ship’s computers have found something, something they can’t explain: a star that just winked into existence. They couldn’t see the star before, because it was hidden behind a structure nearly the size of our solar system. Captain Redwing is awakened as well, along with biologist Beth Marble (she and Cliff have a relationship), and a handful of other crewmembers. They need to understand this giant structure, but they also need to reserve the dwindling food and air stores they have on the ship. The structure is a gigantic bowl like structure, the “bottom” is mirrors aimed at a star, and the “sides” are all biome. There’s a magnetized hole in the bottom, and the mirrors cause ripples and disturbances in the star’s surface, and the magnetized hole pulls a jet of agitated plasma away from the star, propelling the huge machine forward through the cosmos. The scene where Beth pilots the ramscoop ship through the plasma jet absolutely blew me away, and I will forever remember it as one of the most amazing scenes I’ve ever come from across in a hard science fiction novel. Once through, and into the inside of the bowl, it would be a crime not to explore further.